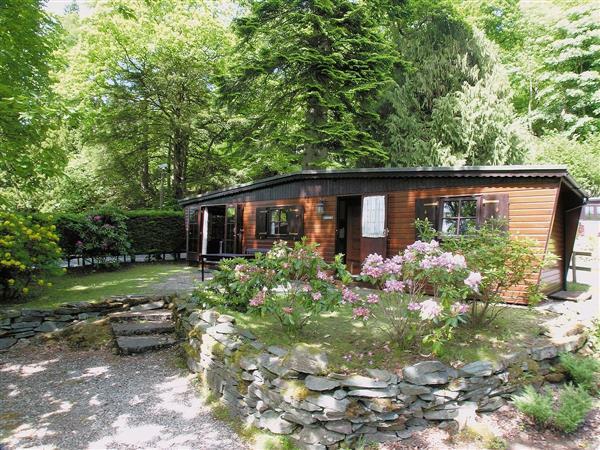 Elterwater in Skelwith Bridge, near Ambleside sleeps 4 people. Set in 2.5 acres of beautiful natural grounds and woodland, this charming wooden holiday lodge with its own private garden has use of an excellent indoor heated pool, sauna, jacuzzi, table tennis and Wi-Fi access, shared with other lodges on this small select holiday complex in the heart of the Lake District. Right on the doorstep of the magnificent Langdales, with Ambleside, 2.5 miles and Coniston, 8 miles, it is a perfect base for touring or simply relaxing and exploring the excellent footpaths in the area. The Lake District Visitor Centre near Windermere is well worth a visit, also the Beatrix Potter Exhibition at Bowness. Shops 2.5 miles, pub and restaurant 0.5 miles. One step to entrance. Ground floor: Living/dining room/kitchen. 2 bedrooms: 1 double, 1 bunk (for children). Shower room with toilet. Electric heaters, electric, bed linen and towels included. Satellite TV. DVD. CD. Electric cooker. Microwave. Shared laundry room with coin operated w/machine and t/dryer. Dish washer. Wi-Fi. Lawned garden with patio and furniture. Shared ground. Parking (2 cars). Shared indoor swimming pool (3.6m x 6m, depth 1.2m), Mar-Nov. Jacuzzi. Sauna. No smoking. NB: Unfenced pond in grounds. Holidays at Elterwater run from Saturday to Saturday. For a better idea of where Elterwater is, you can see Elterwater on the map below. Elterwater is in Cumbria; should you be on the lookout for a special offer, you can find all the special offers in Cumbria. It's always worth checking to see what is on offer at the moment. Do you want to holiday near Elterwater (W42611), you can see other cottages within 25 miles of Elterwater; have a look to find your perfect holiday location.